Elizabeth City State University trustee Dr. Stephanie Johnson, 2nd from the left, presented a check for $100,000 at the June 12 ECSU Board of Trustees meeting with Interim Chancellor Dr. Karrie Dixon, left, center, and left to right, ECSU Foundation Board Chair Dr. Jeanette Evans, ECSU Board of Trustees Chair Rev. Kim Brown, and Vice Chancellor of Advancement Dr. John M. Lee, Jr.
Darnell and Stephanie D. B. Johnson have demonstrated their commitment to Elizabeth City State University as students, professors, and participation on the Board of Trustees. And now a $100,000 commitment will ensure that generations of ECSU students have the opportunity to follow their example. 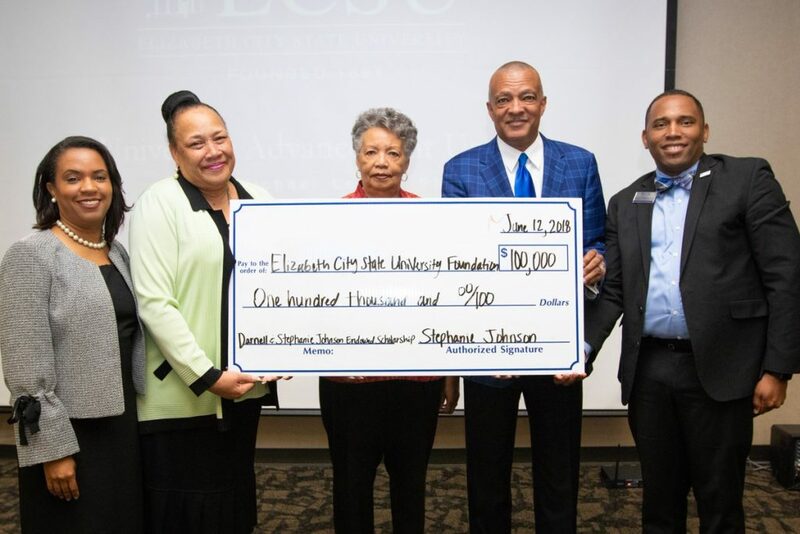 At a recent ECSU Board of Trustees meeting, Vice Chancellor of Advancement Dr. John M. Lee, Jr. recognized Dr. Stephanie D. B. Johnson, an ECSU trustee and 1974 alumnus, for establishing a $100,000 endowment, The Johnson and Johnson Endowed Scholarship Fund. The donation, made during ECSU’s preparations for the second annual “ECSU Day of Giving,” helped eclipse the university’s goal of raising $150,000 in private donations for the one day, end-of-year fundraising campaign. Endowed scholarships are crucial sources of scholarship funding as they generate annual returns on investment used to award scholarships to deserving students in perpetuity. Johnson and her husband have committed their entire careers to advancing education opportunities for others. She currently serves as the Coordinator of the MA Program in Educational Leadership at Hampton University, College of Virginia Beach, and is also the Mid-Atlantic Regional Director for the ECSU National Alumni Association. She also holds a Master of Science in Elementary Education and a Certificate of Advanced Studies in Elementary Education from Old Dominion University and Doctorate of Administration and Policy from The George Washington University. Dr. Darnell Johnson, who passed away in 2017 at the age of 66, served in the Portsmouth Public School system for 30 years where he served as a math teacher, assistant principal, community school liaison, and assistant band director at Manor High School, and later as principal of The Alternative School and Churchland Middle School. Upon retirement he joined Hampton University as Assistant Dean of Education and later, ECSU as Chair of the Mathematics Department as an endowed professor. The Johnson and Johnson Endowed Scholarship awards the accomplishments of Honors College students each spring, benefitting one senior mathematics major with a GPA above 3.000 and one senior elementary education major with a GPA above 3.000 who has attended ECSU for at least four years. 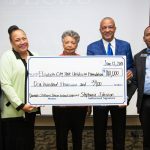 The ECSU Foundation serves as the steward of private contributions to Elizabeth City State University in order to provide educational assistance for students, to support faculty, and to secure the operational needs of the university. The Foundation receives, invests, and administers funds received through charitable contributions on behalf of the students and programs at ECSU and, as a result, for the greater good of the community. For more information about, or to support the ECSU Foundation, please visit www.ECSU.edu/Foundation.